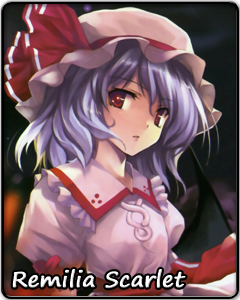 Remilia is known throughout her world as the Eternally Young Scarlet Moon � an almighty, half a millennium old vampire who once shrouded all of the sky in scarlet mist and is said to reign over fate itself. Maintaining that image is of benefit to her and she probably finds it most amusing. But ask anybody who knows her well enough and you'll learn Remilia is in fact an eternal child � whimsical, impatient and used to always having things go her way. The bits about her overwhelming power are true, though. Easily bored, Remilia is constantly on the lookout for new ways to amuse herself. Other than the above-mentioned scarlet mist incident, her most infamous endeavor was an expedition to invade the moon, which also served as an excuse to organize a lavish party. Social gatherings are Remilia's favorite way of flaunting her influence while spending time in an agreeable manner. If Remilia's reputation as a villain and a refined lady is questionable, her gift for leadership is indisputable. She has gathered around herself not only a virtual army of fairies, but also an assembly of powerful individuals. Remilia's confidence is no wonder if you consider her as the mistress of the Scarlet Devil Mansion - a great political power in its own right. One shiny morning, this childlike vampire may knock on your door, a handy umbrella shielding her from the sunlight, and invite you to a party. You might as well accept the invitation � Remilia might bite, but, as a light eater, she leaves her victims plenty of blood.